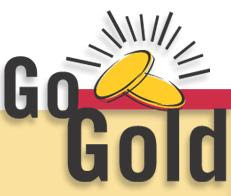 Go for the Gold : Golden opportunity to upgrade to Tally 9. For the user of Tally here comes another chance to get upgraded to Tally Multi user version. 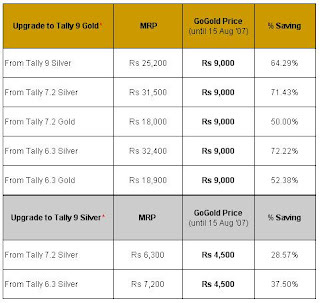 Go Gold scheme of Tally is here. This scheme is for all those users who are old customers of Tally. 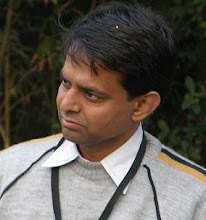 It is applicable to all Tally 6.3 users as well as Tally 7.2 users. All the users of Tally Silver can now upgrade to Tally 9 Multiuser Just in Rs. 9000/-. You can check the eligibility of your Sr. No. of Tally and upgrade. Upgrade is necessary as now Tally 7.2 is closed and no more support would be available for it. Latest statutory rules and future changes in it would be available in Tally 9 only. Tally 9 benefits are still there like the fast processing and features like, job costing, POS invoicing etc. Just visit This link of Buying Tally and press add to cart button. It would ask for sr. no. of your existing Tally. Enter the Sr. No. and see if your product is eligible or not .